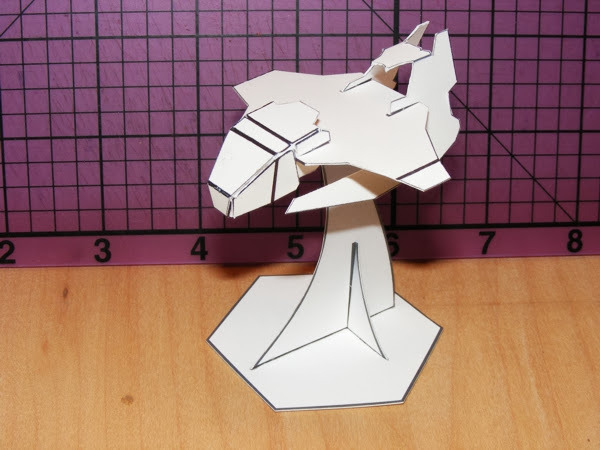 I've begun working on new versions of our Armor Grid Infantry and new VTOL Aircraft designs. First up: Infantry! The main infantry miniatures are remaining mostly the same, but I've separated out the weapon tripod and redesigned it. The weapon tripod is now a true tripod (three legs instead of four) and I've updated it to be a single piece (not counting the weapon). Now the infantry's support weapons can be added or removed at the players discretion. This shows the tripod by itself on a 40mm hex for scale. The next two photos show the tripod on the base with the troops. The first shows it over the crossed center and second shows it next to the troops. I want to design the VTOLs with a few different options for wings, tails, and cockpits. And I want the wings to be reversible. If you look closely at the first and third photos, you can see that the wings have been reversed, one swept back and one swept a little bit more forward. Wow - simple yet impressive design! Add to this some modding options and it will rock!!! I love to see how a army. It looks great. There will be other types of infantry? Thanks! The other troops will be the same types as our previous release: Light, Heavy, and Jump Troops. You can see their original development HERE and pick up those troops for free HERE. Yes! I can't wait, they look sweet! Definitely picking up the whole line of minis when these are released for sure! Again the VTOLs wip is looking awesome and the options ideas sound perfect! I was wandering is there also plans for there to be a few different weapon options like the mechs and vehicles sets had? I'm planning to include the same weapon options as the Motor Pool and Mech Factory sets, with nose turrets (nose turrets? that sounds weird) and wing mounts. 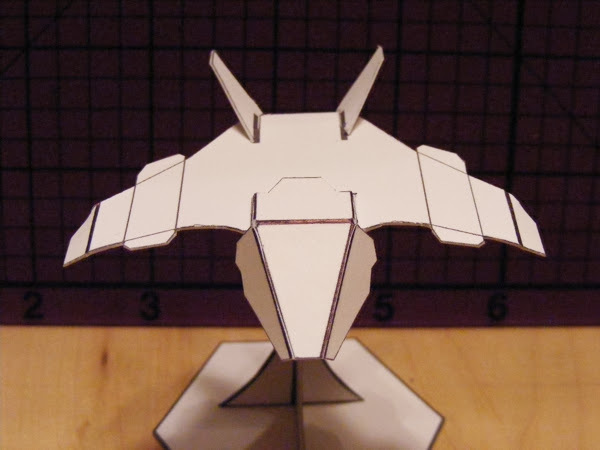 I may also include more streamlined weapon pods that would fit in better on a high speed aircraft. Definitely sounds awesome and nose turrets will be a neat addition. Will you be designing custom flight stands for the VTOLs as well? I can't wait to see the set in action, you got me sold on Armor Grid with VTOLs, lol! Will you be designing custom flight stands for the VTOLs as well? I'd like to use a modified version of my original Flight Racer bases shown in THIS THREAD, but they proved a little fiddly to construct. Basically this was a collapsible camping cup made flatter and in paper. An update with some experimenting and tweaking will be required. I also have grown fond of the dollar store plastic shot glass base, so maybe I'll have a more static base option as well as an expandable one? That sounds awesome, I always thought that was a neat idea for an expandable flight stand and would work well for the VTOLs. Also you can't go wrong with dollar store cups! This is the next wave of test models. All the parts from these will be interchangeable the other designs. The cockpit and wing almost remind me of a Halo Pelican (which is a good thing). 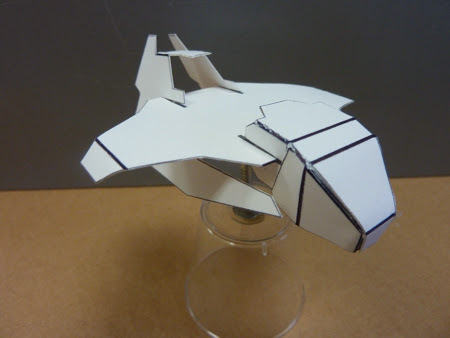 The prototypes for the Aircraft are completed with flight bases. The three types are fighter, attack (maybe gunship), and cargo, but all parts are interchangeable. That way you can define them as you wish. I've also rescaled them by 75% to be a little smaller. The bases are about two inches tall with a 50mm hex base. 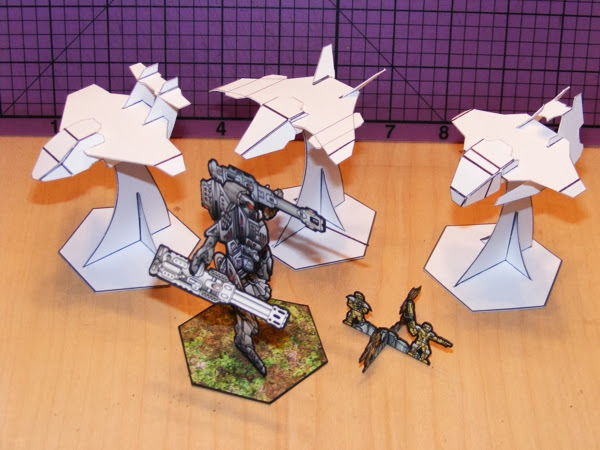 First up: The Three Aircraft with a Heavy Mech and Infantry for scale. Looking forward to seeing these. I'll second that squirmydad, They look really good. Wow those look awesome!!! I love the way the fighters wing design looks, a lot! Definitely looking forward to seeing them textured! I think I'm going to convert the one I labelled "Attack Aircraft" into a 'copter-type aircraft. The tail style and angle lends itself to the landing gear on a helicopter. 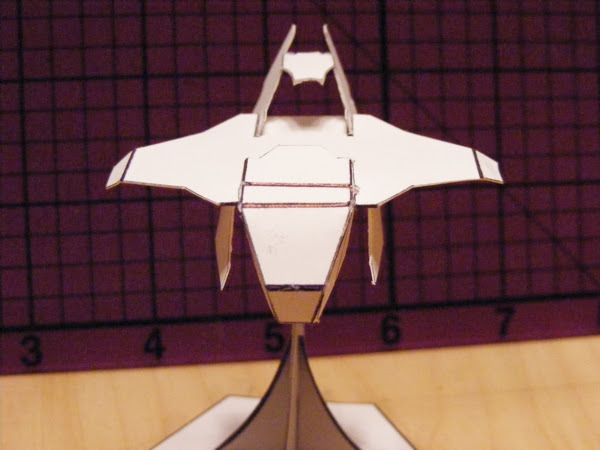 Miniature design question: I worry about the individual rotor blades being too thin, so I was thinking of adding some "air swoosh" to beef them up a little. I fear this may be too cartoony. I thought about suggesting adding a piece of clear blister pack to the build, but I wonder if that is too toy-like and I don't like to have the builder add anything that isn't paper or glue... 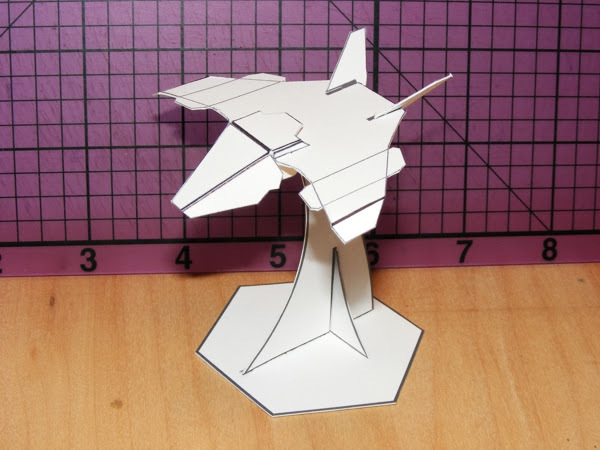 Does any one have any thoughts on paper rotor blades? 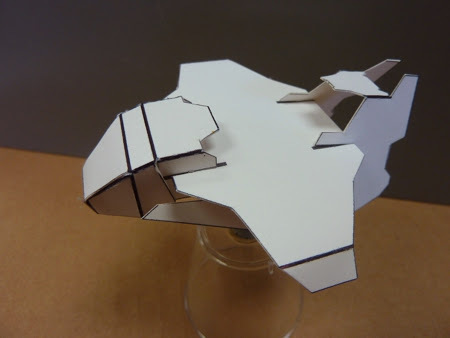 Miniature design question: I worry about the individual rotor blades being too thin, so I was thinking of adding some "air swoosh" to beef them up a little. One can just cut the holes and have a sturdy thing. Two thoughts, make the rotor blades 3D. 1 Rather than just flat blades give the blades a cross section like this, but that doesn't seem to fit with the design philosophy. 2 As it is a scifi craft, blade configurations that would not work now, could potentially have suitable materials available. The outer circle would also give support to the individual blades. With regard to clear acetate rotors on aircraft, as a wargamer of too many years I believe that there is nothing wrong with a clear rotor with squiggly line indicating the blades. It is almost a universal look in wargaming circles. 10 minutes to write a post I'm getting slow in my old age. I second what parduz says. Lol, Parduz beat me to it too. I was going to make an avatar reference for the blade style, Lol. 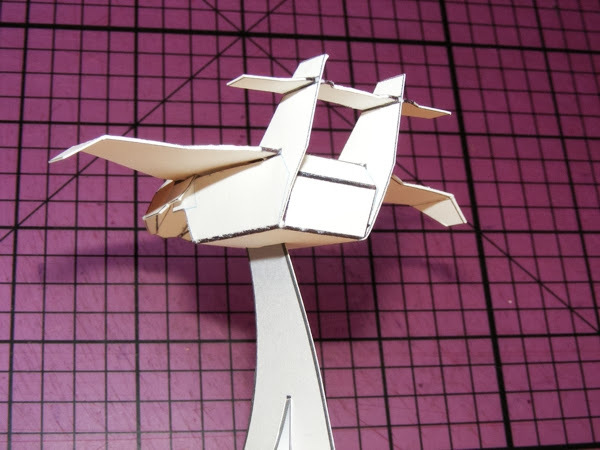 I agree, enclosed blades would give you extra support your looking for around the blades, (that the blade tips would be attached to) with out any extra/added materials (other than paper and glue). It would also still maintain the sci-fi chopper look. Also I just got to thinking if your going for a single rotor on top, you could always try an inner ring, like the ring around the outside of the blades only midway on the blades themselves for added support. It also wouldn't require something the full length or full outside diameter of the blades. If you're doing small enclosed rotors as pictured above, instead of blades the length of the body, just filling in black (not pure black, more like a Paynes Grey) between them should work just fine at 15mm scale. I did this one a long, long time ago and sandwiched another layer in between upper and lower surfaces of the blades. I actually had to 'curl' them a little to make it look normal. Helicopter blades at rest droop. This is a larger scale model than 15mm. Over at Fiddlers Green there are spinning prop templates. Print out on transparency and they look good. Rather than try to depict the rotor blades at rest, I'd try to depict them spinning. So you could use a round disk with circular lines as if the blades are blurred. Imagine a clear vinyl album where each groove is a black line. The disk could be a nice light blue if you want to simply print on paper... a line art only disk would be nice if you want to print it out on transparency. 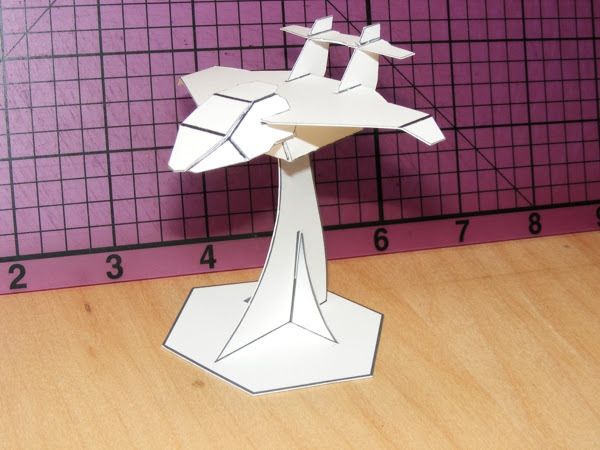 Those spinning prop templates are what I was thinking of. I like the little note at the bottom "Not for use on models of jets"... that's funny. Actually would be perfect if a couple versions could be included to fit the builders preference. A spinning blade version that can be printed on paper or transparent sheets and a blade at rest version that's printed on paper. Gives me an idea to make a crash site obstacle with a crashed aircraft and at rest blades scattered lol, if the option is available. Printed paper disks would just look wrong in my opinion, and hide a good portion of the actual model.